Stripped, showered and drugged, Luanne Kilpi's life as wife and mother is turned upside-down as she enters the world of the insane. After her attempted suicide following the death of her three-year-old son, Luanne is admitted to the Traverse State Hospital where she now lives with locked doors, long hallways, gowns, moans and shouts, restraints, pills, little fluted cups and a sparse tiny bedroom. She is an "Admission." On Hall 5, the reader is introduced to the group of young women who become Luanne's friends and support. We see the realities of their conditions and watch them struggle through muddled emotions to make sense of their world. 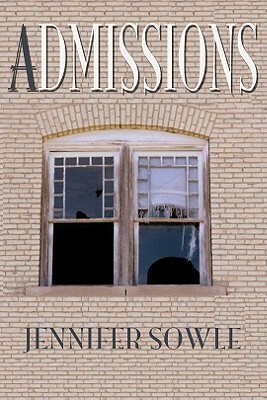 Author Jennifer Sowle's lyrical prose illuminates Luanne's raw emotions of overwhelming grief as she struggles on her journey from despair to hope. Set on the expansive grounds of the State Hospital, vivid imagery brings to life a cast of characters from the duty nurses to the groundskeeper to the chronically ill patients. This is a book that makes you stand up and cheer for the resiliency of the human spirit.